Message 1305336 - Posted: 12 Nov 2012, 11:53:16 UTC - in response to Message 1305321. Bandwidth is something we're trying to work on (GPUUG - Lab - UCB) though the process is quite Sysyphean. I wish I could throw donor money at the problem and solve it but sadly that's out of my hands unless we do something creative (and expensive). One way would be to get something like an ISP to donate bandwidth. We can't get that bandwidth to the lab, but we could place a proxy/workunit storage at the ISP. 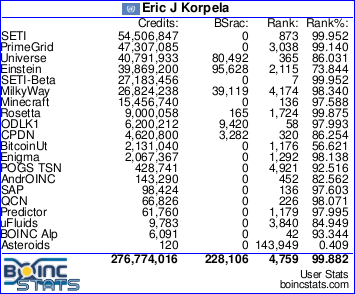 I'm not sure the BOINC back-end could handle that. But if it could we could essentially halve the labs bandwidth requirement since we would only have to transfer an individual workunit once. Message 1305417 - Posted: 12 Nov 2012, 17:43:31 UTC - in response to Message 1305336. At some stage the data has to get back to the lab, and come from the lab, and the bottleneck to the lab still remains. Message 1305427 - Posted: 12 Nov 2012, 18:00:54 UTC - in response to Message 1305417. Each workunit is sent to, at least, two users. If the workunit is sent once to an off-site server from which the users download their workunits the lab would use less than 50% of their current bandwidth. 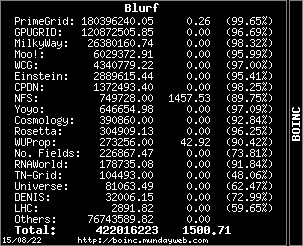 It's the workunit distribution that's the big problem, the results files returning to the lab are much smaller. Message 1305440 - Posted: 12 Nov 2012, 18:20:52 UTC - in response to Message 1305427. And the savings in bandwidth there would be taken up by the bandwidth that is now internal in the lab in between server communications. It's a case of either getting bandwidth available to the Lab, or moving everything to where the bandwidth is available. Message 1305444 - Posted: 12 Nov 2012, 18:24:18 UTC - in response to Message 1305427. SETI@home already benefits from a cost-effective ISP (Hurricane Electric) who provide a gigabit service to their termination point. The trouble is, their termination point is inside the PAIX, which is, by its very nature, a highly-secure, restricted access, building. SETI does have one item of (donated) equipment in there - a tunnelling router - but anything more would require the allocation of rack space, power, cooling.... probably all in short supply in what is primarily a switching, rather than data, centre. I think your idea would work, at a technical level - effectively putting a 'data doubler' on the most congested part of the network - but at the cost of added complexity, especially in the extreme case where hardware maintenance is needed urgently (what happens when a disk fails, for instance?). I think, as so often before, this comes into the category of "moving the problem from one place to another". And let's not forget that the integrity of the science must be maintained at all costs. Having all data stored and kept in the main Seti site is foremost. I know that the idea has been floated to offload the WUs to a secondary server off of the campus where access might be better to the users. But, I don't see this happening. We ARE dealing with true science here, folks. And I don't think that should be trivialized. Message 1305456 - Posted: 12 Nov 2012, 18:50:43 UTC - in response to Message 1305444. Well, the "proxy" wouldn't have to be in a high security location, as long as there's rack space and bandwidth available. It wouldn't even have to be in the same hemisphere as the lab as long as there's a S@H volunteer around to handle hands-on tasks. Obviously it's adding complexity to the system, but it's one way around the seemingly impassable obstacle of S@H lab bandwidth. It really shouldn't require much physical handling. Everything other than hardware failure can be handled remotely. And the server could be built to be failure resilient with storage arrays running hot spares, etc. Message 1305463 - Posted: 12 Nov 2012, 18:56:32 UTC - in response to Message 1305452. I'm sorry, I don't understand your reasoning. Are you afraid that someone would try to hack the server and manipulate the data if it was located outside of the lab? Message 1305466 - Posted: 12 Nov 2012, 18:59:44 UTC - in response to Message 1305456. It wouldn't even have to be in the same hemisphere as the lab as long as there's a S@H volunteer around to handle hands-on tasks. If there were more staff, would we even be having some of these discussions? I don't think I can help much from here in Wisconsin to assist the administration of things. If y'all got any ideas how I could, I'm all ears. Message 1305478 - Posted: 12 Nov 2012, 19:08:46 UTC - in response to Message 1305456. Well, the "proxy" wouldn't have to be in a high security location, as long as there's rack space and bandwidth available. I think that to reduce latency, having it as close as possible to both the data source (i.e. the lab), and to the high-bandwidth ISP, would be indicated. That points to a pretty secure location, whoever hosts it - I doubt many SETI volunteers have that sort of geography, and also day-to-day access to a building with a spare continuous 200Mbit+ outbound internet service. Message 1305481 - Posted: 12 Nov 2012, 19:12:06 UTC - in response to Message 1305466. The hands-on tasks wouldn't be too much of a hardship. More like a server shipped to the location and after a few years when enough storage array HDDs have failed and we are running out of hot spares the volunteer (or an employee of the hosting site) would replace the broken ones. Message 1305485 - Posted: 12 Nov 2012, 19:15:28 UTC - in response to Message 1305478. LOL.....I don't think my ATT DSL would get that done. It keeps 9 crunchers locked and loaded, but a few hundred thousand? Besides, even if I could get the infrastructure on the premises, I'd have to start doing my own fundraisers to finance it. Message 1305502 - Posted: 12 Nov 2012, 19:35:40 UTC - in response to Message 1305478. You wouldn't have to have day-to-day access to a hosting site, or even access at all. High security sites that hosts external servers can remove the server from the server room to a workshop where you can work with it before being returned. And as I said above it wouldn't be very often. So you wouldn't have to find a S@H volunteer with that kind of access. "Just" find a company willing to donate bandwidth, and hopefully find a S@H volunteer within driving distance of the site. Message 1305532 - Posted: 12 Nov 2012, 20:28:37 UTC - in response to Message 1305444. Message 1305535 - Posted: 12 Nov 2012, 20:32:08 UTC - in response to Message 1305532. Well, Seti IS about dreaming, ain't it now? Message 1305597 - Posted: 12 Nov 2012, 22:44:46 UTC - in response to Message 1305466. This has been discussed with Eric and he said it would have to be such a tremendous donation drive that it's impossible. The drive would have to include the cost of benefits so I believe it'd be over $100,000 just for 1 full-time person for 1 year. Message 1305606 - Posted: 12 Nov 2012, 23:05:04 UTC - in response to Message 1305532. The SETI download pipe is 100 Mbits per sec or 12.5 MBytes per sec. 45 GBytes per hour. If a caching proxy had that much cache space it would be enough to handle the initial replication downloads under most circumstances. So instead of averaging ~2.15 downloads per SaH WU and ~2.78 per AP WU, the download servers would only be burdened for ~1.15 and ~1.78. Squid could do that kind of caching proxy. Hurricane Electric has two data centers in Fremont, California which provide colocation services to large companies, some of which might have the relatively minor additional capacity SaH would use. Or HE itself might be able to provide an affordable deal since they're already SaH's ISP. One concern I'd have is that even effectively increasing the amount of work which could be delivered by 60 or 70 percent wouldn't help for long. Users love to buy new, more capable systems so pretty soon the download pipe would again be saturated and mainly controlled by internet congestion. Nevertheless, that much increase of project productivity seems worth considering if it doesn't break the budget. Message 1305625 - Posted: 12 Nov 2012, 23:57:04 UTC - in response to Message 1305597. If fundraising for staff salaries is ever considered, I'd far prefer to see the establishment of an endowment fund that would fund the post for an extended period (minimum five years), or in perpetuity from investment income. Otherwise, you're condemning someone to a dead-end job - either working towards their own redundancy, or constantly raising funds towards their own continuation. Neither is pretty, or conducive to a productive and enjoyable working environment. The figures would be frightening, but I still like to see what the US actuarial figures would currently be for a one-salary permanent endowment. Message 1305642 - Posted: 13 Nov 2012, 0:40:47 UTC - in response to Message 1305463. Yes, that is one of the concerns. In scientific research, integrity of the data is sometimes as important as chain-of-custody is for evidence in a criminal prosecution. Message 1305941 - Posted: 14 Nov 2012, 0:44:09 UTC - in response to Message 1305625. I'd far prefer to see the establishment of an endowment fund that would fund the post for an extended period (minimum five years), or in perpetuity from investment income. We would love to see an endowment capable of funding the whole program or even providing a single income. We have had term endowments in the past in the $10K-$30K range with 2 or 3 year terms to pay for operations of specific projects. To pay for a person is another scale entirely... a just out of school junior programmer with salary and benefits really does run close to $100K even in the current job market. A perpetual endowment usually has different assumptions and can achieve higher growth, but we could assume the instantaneous payout of $100K is equal to a 4% growth and which means it would need to be at least $2.5M. And to run the whole project in perpetuity $10M-$15M would be the target vicinity.